New Barbados government – But change or no change? 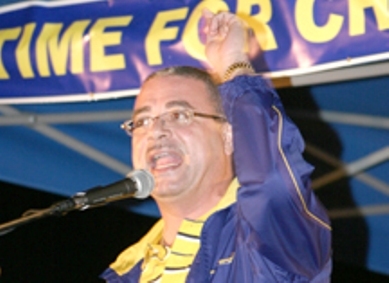 Owen Arthur a UWI trained economist wanted his Barbados Labour Party to emulate the People’s National Party in Jamaica by winning a fourth consecutive general election, a fabled no-no in Caribbean ding-dong political culture. But that wasn’t how he would imitate the PNP, whose administration he had served as a technocrat in the 1970s; it was in losing like Portia Simpson did last September even as pollsters weighed her in as the most liked leader. It was a lopsided victory for the DLP as nine BLP ministers lost their seats. But it was not as humiliating as when the Dems lost to the Bees in 1994 and Thompson and his two colleagues that won their seats were dubbed the “three blind mice”. Prior to the election the BLP held 24 of 30 seats in parliament. The fledgeling People’s Empowerment Party led by left wing party-hopper David Copmmissiong, which fielded four candidates, made no impact, nor did the two from the little-known People’s Democratic Congress and the two independents. During the campaign, Arthur charged the DLP with taking donations from Taiwan, in return for promising to switch allegiance from China. The opposition and the Taiwanese government denied the charge. The Dems had in turn suggested that Arthur had access to undeclared bank accounts, an allegation that he rejected. As it turns out, it was the spiraling cost of living brought on by the global economic situation and Thompson’s ability to bring out a new cohort of youth voters that decided the election result. While both main parties are regarded as democratic socialist, the BLP, which originated from workers’ struggles in the 1930s and 40s, had conceded the progressive label to the DLP in the 60s, 70s and 80s being identified with big business and landed interests. Despite the left-wing political label on the parties, the island is often derided by its fellow Caribbean Community (CARICOM) nationals for its conservatism. But Arthur turned the tables on the Dems in 1994, claiming ownership of grassroots and Afro-Caribbean causes. The country boasts one of the highest standards of living among developing nations and persistently tops the UNDP’s Human development Index which ranks countries on quality of live measures like education, health care and social services as well as economic perfromance. The country’s estimated 2006 GDP per capita (PPP) was US$18,400. A former sugarcane monoculture, the island has developed its economy largely through high-end tourism and offshore financial services. While is has significant deposits of natural gas and oil, the volume of oil pumped, which is refined in Trinidad, could supply only about half of the island’s demand. Barbados, which gained independence from Britain in 1966, has a population of 280,000 and boasts the second oldest elected national assembly in the hemisphere (after Bermuda), having celebrated 350 years of parliamentary government in June, 1989. With both parties committed to CARICOM’s regional integration policies, the DLP victory is not expected to alter the country’s regional or international agenda. For example, unlike many other CARICOM patners who have signed on to Hugo Chavez’s concessionary Petro Caribe initiative, Barbados maintains it will continue its oil sourcing from Trinidad and Tobago.